Before leaving for Ramallah, I heard no such insights. Most people don’t have a ready-made image of what things are like in the Palestinian Territories, or certainly not an accurate one. When I first arrived, some of my most well travelled friends and family members asked me if I heard lots of gunshots and explosions here. One Israeli friend who has lived in Tel Aviv his whole life said he was surprised to see how “normal” and colorful the West Bank looked in my photos. Once through the Israeli checkpoint and past the harrowing free-for-all stretch of road into Ramallah, things do seem “normal”. There is a corner market at the end of our road where I go for eggs and bread and milk, and I’ve found my local fruit and vegetable shop. Ramallah houses the headquarters of the Palestinian Authority government, and while I wouldn’t describe it as cosmopolitan, it has all the hallmarks of a small modern city. Road works are de rigueur here and by all accounts new buildings are going up faster than they can be filled. There are plenty of nice places to eat, dozens of upscale café’s, bars and restaurants, for those who can afford them, a selection of cheap and delicious hummus places, and a few good traditional Palestinian restaurants. I have not heard any gunshots or explosions, and there are lots of Palestinian police patrolling the streets. People here tell me that conflict between Palestinians and Israeli soldiers in Ramallah has declined massively in the past 5 years since Israeli forces withdrew to the outskirts of the city. I’m told the Israeli army does sometimes carry out raids in Ramallah but you rarely see it. 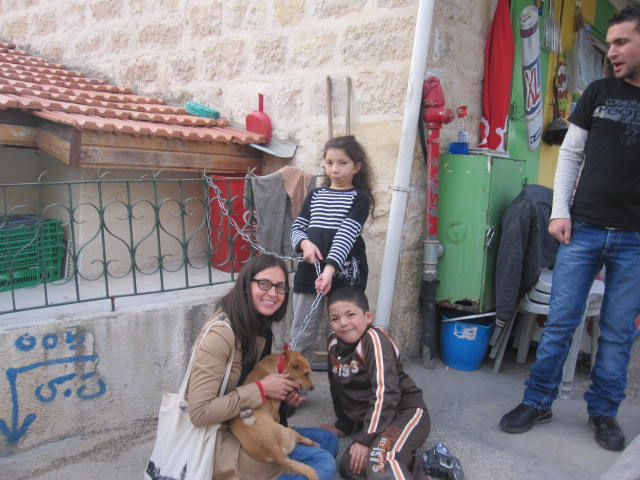 As I have been exploring the place, there is one thing that sets Ramallah apart: the sheer friendliness of people here. The other day, I wanted to pick up a map of the city, so made my way to the newly opened Ramallah tourist information office. Inside, I found Hamza, a clean-cut young guy with perfect English, looking a bit bored behind a stone desk. I couldn’t help but wonder how many people darkened his door, and I asked if the office sees much action. He said that they’d only just opened a month ago and he was hopeful, but admitted that tourism in the West Bank was a tough business. We chatted for over an hour and Hamza turned out to be one of the most articulate, intelligent and nicest people I’ve met in the last four months of traveling. In addition to loading me up with maps and tips for things to see and do, he told me a bit about what life is like here. Hamza painted a complicated picture. He said while he loves Palestine and would never leave, jobs and freedom of movement are so limited it’s easy to feel defeated. From there I crossed the street to a corner store where I had spotted what looked like a good wine selection. Next to the tiny shop front were two little kids playing with a puppy they had chained to a fence. Before I could step through the door, the woman who runs the shop told me her kids — who were speaking in excited, rapid fire Arabic — wanted me to pet their dog. Bemused, I changed tack and walked over to them. The dog’s name, I was told by a little girl of maybe seven, was Max and she and her little brother, wanted me to pick him up. I played with the kids and the dog for maybe 45 minutes. I’m not sure what they found so interesting, but they seemed adamant that I sit on the ground with the puppy on my lap. Once I finally made it inside, I was pleased to find the shop did indeed have an impressive wine section and a nice chocolate stock too. The shopkeeper bid me adieu and told me to come back soon. With my wine in tow, I started back up the steep hill to the Englishman’s apartment, past a sprawling nursery selling lush orange trees, potted flowers and a range of clay pots and garden fountains. Sitting amongst his goods in a folding chair, a middle-aged man with a head of thick salt and pepper hair and a stubbly beard waved for me to come over. I walk past this nursery on each trip to and from the apartment, so had waved to him before. This time though, as I walked over to where he was sitting, he offered me a cup of sweet minty tea and motioned for me to pull up a chair next to his. The jovial man with an easy smile, I learned, was named Muhamed. He wanted to know where I was from and seemed interested in practicing his English. He told me I needed to learn Arabic. I told him he was asking me some big questions, ones that I have been grappling with myself, and didn’t have the answers to yet. That really made him laugh. He told me his son was studying to become a dentist, but that he was worried there wouldn’t be enough work for him to be successful. We said goodbye and he told me to come back anytime. We could drink tea and work on my Arabic. I definitely sense that there are a lot of intelligent people who have a bit too much time on their hands here and there is an overall feeling of boredom and frustration among some. But the people I have encountered seem genuinely interested in knowing about me and have made me feel welcome here. People often talk about how friendly and hospitable Americans are, but I think Palestinians, at least the ones I’ve met, are miles ahead in this category.